Chris posted about La’s DeFeet of Cuteness contest, and I can’t resist, of course. Kitten toes are one of my favorite things, and Annabelle’s toes are the best. This is the picture I posted for my A in the ABC-Along last year, and her toes are just as sweet today. I was hoping that soft cat toes would distract you. No, eh? I don’t have any knitting to show. I’ve been knitting, but just a little. Our inventory went well, but we are tired and our hands need pampering. Flipping books over to scan their bar codes is part of my work life. Flipping hundreds and hundreds in one day is another thing. I have nearly enough self-discipline to rest my hands. Nearly enough. I’ll finish up the second Monkey sock in the next day or so. I already have an idea for my next pair, and more ideas are percolating beneath that. Right now, though, it’s time to go to work! Annabelle toes! Yay! !I remember how dry and tired bookstore work made my hands. Sounds like you need one of those warm wax treatments! Ah, cat toes. Love them.Yarrow, our Marmalade, has turned into a guard cat. Apparently he didn’t think I was quite fascinated enough by his every move, so now he’s emmulating our dog. Another thing to try is Mary Kay’s Satin Hands – it’s wonderful! Just popping in to say hi. Oh, tucked in Annabelle toes! 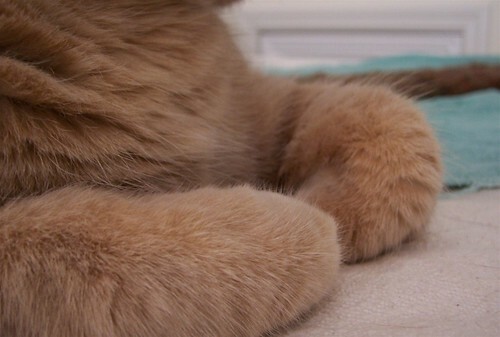 Cat feet are the best, so soft and furry. Get some rest for those hands. love those toesiesremember to do your hand relaxation exercises while you’re working 🙂 I hope that inventory goes by fast! do you want to try some of my emu oil — it helps my hands not only the dry part but the sore part too… let me know. k? Oh my Cat toes! Did you ever have a cat with too many? And, did you say that the ABC-along is over? I’m going to have to pitch a fit, I guess. I got up to U going backwards, but only because W was forgotten.